Wolves chief executive Jez Moxey says that the promoted League One club's major achievement this season has been to win back their fans. 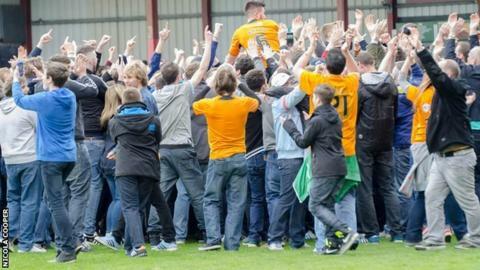 Wolves sealed promotion back to the second tier on Saturday, and know two more wins will secure the league title. "It's been a tremendous success," Moxey told BBC WM. "And we're delighted with the way the team has played under Kenny Jackett this season. "But it's more trying to re-establish a relationship with the fans." He continued: "You can't be successful without the backing of your supporters and we've got them back. "I know you can do that just by winning and being successful, but this season has been more about the fans, for the fans and for the future of the club. "We were in a dark place last season after two successive relegations. And it required a concerted effort to rebuild. But I think it's been a really good job done. "The scenes at Preston on the first day of the season and seeing the 9,000 we took to Milton Keynes the other week, that will live with me for a long time. "Then going to Crewe on Saturday and seeing our fans celebrate like that was the culmination of a memorable season." As far as the club are concerned, the job is not yet totally done, with sights set on the League One title too. Six points clear of second-placed Brentford, with four games left, and a massive advantage on goal difference, that would be all but sealed if they win their two games over Easter. They are up against two sides, Rotherham United and Leyton Orient, who are still trying to beat Brentford to the second automatic promotion place. But Wolves have, in head coach Jackett, a totally professional operator determined to ensure that the whole job is completed. Wolves head of football development and recruitment Kevin Thelwell earmarked him for the role when Jackett's time at previous club Millwall came to an end - and Moxey cannot pay high enough praise to the job done by Jackett and his number two Joe Gallen. Following the sacking of Mick McCarthy in February 2012, and the even more crucial failure to have a replacement lined up, Wolves were relegated from the Premier League under Terry Connor three months later. And, last season, under first Stale Solbakken, then Dean Saunders, things became even worse. "We made some poor appointments and they didn't work," admits Moxey. "But the appointment of Kenny Jackett was extremely crucial. We found a man who matches our ideals as closely as anyone could and who has carried out the job in exemplary fashion. "It was Kevin Thelwell who was responsible for creating the initial list of prospective candidates, which was subsequently approved by me for 'sieving or filtering' prior to interview. "It seemed natural that he was the kind of man we ought to be talking to. "But no-one tipped us off. It was our own conclusion that he would be worthy of an interview as he fitted the bill in terms of his achievements, promotions with Swansea City and Millwall, the right level of experience in the English game and a commitment to youth. "But the interesting thing is to underline that was the only changes we made," added the Wolves chief executive, who has now seen the club earn three promotions in his 17 years at Molineux. "A lot of people in football think that what you've got to do is allow a manager to come in, take everybody out and then bring all of his own people in. But we don't believe in that. "The structure of the club has stayed the same. What goes behind the scenes from the support staff is just as important. We were resolute on that. "If he hadn't said the right things, and we hadn't said the right things to him, then the marriage probably wouldn't have been consummated."